This Place of Worship was founded in 1840, but we understand it was closed in 1865, and the premises are now in secular use. According to the document Cheltenham Borough Archaeological Assessments, compiled as part of the Gloucestershire Extensive Urban Survey (EUS) of 1995-8, this chapel was built for Association Methodists about 1840, and occupied by them until a Royal Well chapel was built in 1865. 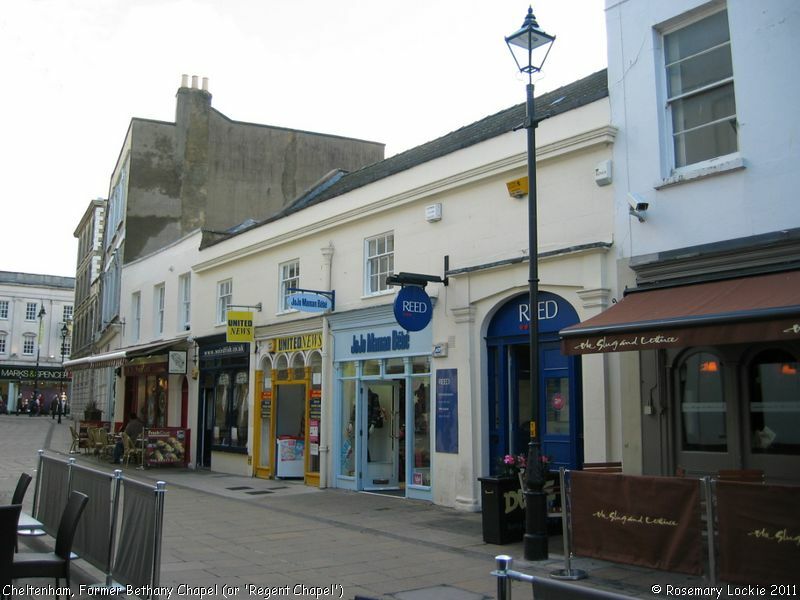 It was known in 1979 as Regent Chapel, though according to the list of Cheltenham - Current and Former Places of Worship on Stuart Flight's "Glosgen" website, it has been used in recent years as an estate agent's premises. At the time of our photograph (2011) it looks like an employment agency! It is described in Non-Conformist Chapels and Meeting Houses, Gloucestershire (1986) as a "plain low building with rendered west front, blank except for a rounded-arched doorway with fanlight near the south end... now used by the Brethren and renamed 'Regent Chapel'". A search of the National Archives 'Access to Archives' site reveals the Gloucester Archives have a bundle D5678/2, for the period 1849-1865 which mentions the Wesleyan Methodist Bethany Chapel, in Regent Street, and the names of Thomas Aquila Dale of Birkenhead, The Trustees of the Bethany Chapel, and Nathaniel Smith of Cheltenham. A further bundle, D5678/3 (1854-1858) mentions 53 Regent Street, and the names of James and William Vaughan, and Nathaniel Smith all of Cheltenham, but it is not clear whether this refers to the chapel property. Now or formerly Wesleyan Association. Bethany Chapel (or 'Regent Chapel'), Cheltenham shown on a Google Map. Please also remember that the former Bethany Chapel (or 'Regent Chapel') is understood to be in secular use, so care should be taken to preserve the privacy of its occupants. This Report was created 23 Apr 2019 - 01:34:52 BST from information held in the Gloucestershire section of the Places of Worship Database. This was last updated on 7 Feb 2019 at 07:45.